●Do not adjust the position of the driver’s seat. Doing so could cause the driver to lose control of the vehicle. ●Do not place a cushion between the driver or passenger and the seatback. A cushion may prevent correct posture from being achieved, and reduce the effectiveness of the seat belt and head restraint, increasing the risk of death or serious injury to the driver or passenger. ●Do not place anything under the front seats. Objects placed under the front seats may become jammed in the seat tracks and stop the seat from locking in place. This may lead to an accident, resulting in death or serious injury. The adjustment mechanism may also be damaged. ●Take care when adjusting the seat position to ensure that other passengers are not injured by the moving seat. 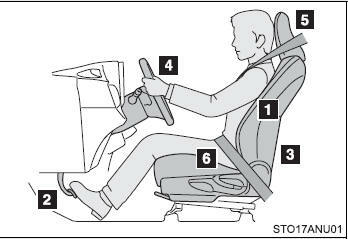 ●Do not put your hands under the seat or near the moving parts to avoid injury. Fingers or hands may become jammed in the seat mechanism.